In Part Seven – GCM I through Part Ten – GCM IV we looked at GCM simulations of ice ages. These were mostly attempts at “glacial inception”, that is, starting an ice age. But we also saw a simulation of the last 120 kyrs which attempted to model a complete ice age cycle including the last termination. As we saw, there were lots of limitations..
One condition for glacial inception, “perennial snow cover at high latitudes”, could be produced with a high-resolution coupled atmosphere-ocean GCM (AOGCM), but that model did suffer from the problem of having a cold bias at high latitudes. The (reasonably accurate) simulation of a whole cycle including inception and termination came by virtue of having the internal feedbacks (ice sheet size & height and CO2 concentration) prescribed. Just to be clear to new readers, these comments shouldn’t indicate that I’ve uncovered some secret that climate scientists are trying to hide, these points are all out in the open and usually highlighted by the authors of the papers. In Part Nine – GCM III, one commenter highlighted a 2013 paper by Ayako Abe-Ouchi and co-workers, where the journal in question, Nature, had quite a marketing pitch on the paper. I made brief comment on it in a later article in response to another question, including that I had emailed the lead author asking a question about the modeling work (how was a 120 kyr cycle actually simulated?). Most recently, in Eighteen – “Probably Nonlinearity” of Unknown Origin, another commented highlighted it, which rekindled my enthusiasm, and I went back and read the paper again. It turns out that my understanding of the paper had been wrong. It wasn’t really a GCM paper at all. It was an ice sheet paper. There is a whole field of papers on ice sheet models deserving attention. Let’s review GCMs first of all to help us understand where ice sheet models fit in the hierarchy of climate simulations. GCMs consist of a number of different modules coupled together. The first GCMs were mostly “atmospheric GCMs” = AGCMs, and either they had a “swamp ocean” = a mixed layer of fixed depth, or had prescribed ocean boundary conditions set from an ocean model or from an ocean reconstruction. Less commonly, unless you worked just with oceans, there were ocean GCMs with prescribed atmospheric boundary conditions (prescribed heat and momentum flux from the atmosphere). Then coupled atmosphere-ocean GCMs came along = AOGCMs. It was a while before these two parts matched up to the point where there was no “flux drift”, that is, no disappearing heat flux from one part of the model. Why so difficult to get these two models working together? One important reason comes down to the time-scales involved, which result from the difference in heat capacity and momentum of the two parts of the climate system. The heat capacity and momentum of the ocean is much much higher than that of the atmosphere. And when we add ice sheets models – ISMs – we have yet another time scale to consider. This creates a problem for climate scientists who want to apply the fundamental equations of heat, mass & momentum conservation along with parameterizations for “stuff not well understood” and “stuff quite-well-understood but whose parameters are sub-grid”. To run a high resolution AOGCM for a 1,000 years simulation might consume 1 year of supercomputer time and the ice sheet has barely moved during that period. Scientists who study ice sheets have a whole bunch of different questions. They want to understand how the ice sheets developed. 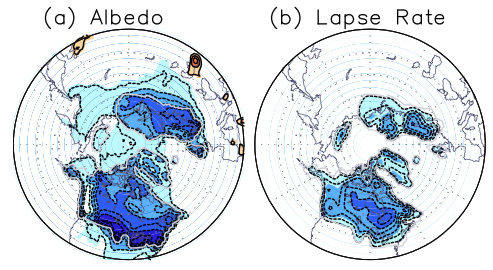 Does our understanding of ice sheet dynamics allow us to model the last glacial cycle? To answer that question we need a model for ice sheet dynamics, and to that we need to apply some boundary conditions from some other “less interesting” models, like GCMs. As a result, there are a few approaches to setting the boundary conditions so we can do our interesting work of modeling ice sheets. Before we look at that, let’s look at the dynamics of ice sheets themselves. We can add that to the 34 papers reviewed in that previous article. This paper by Marshall & Clark is definitely a good quick read for people who want to understand ice sheets a little more. Ice doesn’t conduct a lot of heat – it is a very good insulator. So the important things with ice sheets happen at the top and the bottom. At the top, ice melts, and the water refreezes, runs off or evaporates. In combination, the loss is called ablation. Then we have precipitation that adds to the ice sheet. So the net effect determines what happens at the top of the ice sheet. At the bottom, when the ice sheet is very thin, heat can be conducted through from the atmosphere to the base and make it melt – if the atmosphere is warm enough. As the ice sheet gets thicker, very little heat is conducted through. However, there are two important sources of heat for surface heating which results in “basal sliding”. One source is geothermal energy. This is around 0.1 W/m² which is very small unless we are dealing with an insulating material (like ice) and lots of time (like ice sheets). The other source is the shear stress in the ice sheet which can create a lot of heat via the mechanics of deformation. Once the ice sheet is able to start sliding, the dynamics create a completely different result compared to an ice sheet “cold-pinned” to the rock underneath. Ice sheet deglaciation involves an amount of energy larger than that provided directly from high-latitude radiation forcing associated with orbital variations. Internal glaciologic, isostatic, and climatic feedbacks are thus essential to explain the deglaciation. ..Moreover, our results suggest that thermal enabling of basal flow does not occur in response to surface warming, which may explain why the timing of the Termination II occurred earlier than predicted by orbital forcing [Gallup et al., 2002]. Results suggest that basal temperature evolution plays an important role in setting the stage for glacial termination. To confirm this hypothesis, model studies need improved basal process physics to incorporate the glaciological mechanisms associated with ice sheet instability (surging, streaming flow). ..Our simulations suggest that a substantial fraction (60% to 80%) of the ice sheet was frozen to the bed for the first 75 kyr of the glacial cycle, thus strongly limiting basal flow. Subsequent doubling of the area of warm-based ice in response to ice sheet thickening and expansion and to the reduction in downward advection of cold ice may have enabled broad increases in geologically- and hydrologically-mediated fast ice flow during the last deglaciation. Increased dynamical activity of the ice sheet would lead to net thinning of the ice sheet interior and the transport of large amounts of ice into regions of intense ablation both south of the ice sheet and at the marine margins (via calving). This has the potential to provide a strong positive feedback on deglaciation. The timescale of basal temperature evolution is of the same order as the 100-kyr glacial cycle, suggesting that the establishment of warm-based ice over a large enough area of the ice sheet bed may have influenced the timing of deglaciation. Our results thus reinforce the notion that at a mature point in their life cycle, 100-kyr ice sheets become independent of orbital forcing and affect their own demise through internal feedbacks. In this article we will focus on a 2007 paper by Ayako Abe-Ouchi, T Segawa & Fuyuki Saito. This paper is essentially the same modeling approach used in Abe-Ouchi’s 2013 Nature paper. The ice sheet model has a time step of 2 years, with 1° grid from 30°N to the north pole, 1° longitude and 20 vertical levels. Equations for the ice sheet include sliding velocity, ice sheet deformation, the heat transfer through the lithosphere, the bedrock elevation and the accumulation rate on the ice sheet. Note, there is a reference that some of the model is based on work described in Sensitivity of Greenland ice sheet simulation to the numerical procedure employed for ice sheet dynamics, F Saito & A Abe-Ouchi, Ann. Glaciol., (2005) – but I don’t have access to this journal. (If anyone does, please email the paper to me at scienceofdoom – you know what goes here – gmail.com). Ts is the surface temperature, dP is a measure of aridity and Aref is a reference value for accumulation. This is a highly parameterized method of calculating how much thicker or thinner the ice sheet is growing. 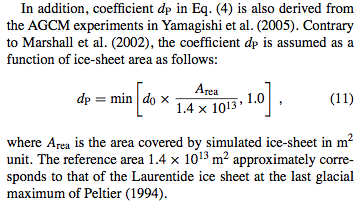 The authors reference Marshall et al 2002 for this equation, and that paper is very instructive in how poorly understood ice sheet dynamics actually are. ..For completeness here, note that we have also experimented with spatial precipitation patterns that are based on present-day distributions. Under this treatment, local precipitation rates diminish exponentially with local atmospheric cooling, reflecting the increased aridity that can be expected under glacial conditions (Tarasov and Peltier, 1999). The parameter dP in this equation represents the percentage of drying per 1C; Tarasov and Peltier (1999) choose a value of 3% per °C; dp = 0:03. So dp is a parameter that attempts to account for increasing aridity in colder glacial conditions, and in their 2002 paper Marshall et al describe it as 1 of 4 “free parameters” that are investigated to see what effect they have on ice sheet development around the LGM. So their value of aridity is just a linear function of ice sheet area – from zero to a fixed value, rather than a fixed value no matter the ice sheet size. How is Ts calculated? That comes, in a way, from the atmospheric GCM, but probably not in a way that readers might expect. So let’s have a look at the GCM then come back to this calculation of Ts. There were three groups of atmospheric GCM simulations, with parameters selected to try and tease out which factors have the most impact. So the idea is to compare results with and without the actual ice sheet so see how much impact orbital and CO2 values have vs the effect of the ice sheet itself – and then for the ice sheet to see whether the albedo or the elevation has the most impact. Why the elevation? Well, if an ice sheet is 1km thick then the surface temperature will be something like 6ºC colder. (Exactly how much colder is an interesting question because we don’t know what the lapse rate actually was). There will also be an effect on atmospheric circulation – you’ve stuck a “mountain range” in the path of wind so this changes the circulation. Now a lapse rate of 5K/km was used. What happens if the lapse rate of 9K/km was used instead? There were no simulations done with different lapse rates. ..Other lapse rates could be used which vary depending on the altitude or location, while a lapse rate larger than 7 K/km or smaller than 4 K/km is inconsistent with the overall feature. 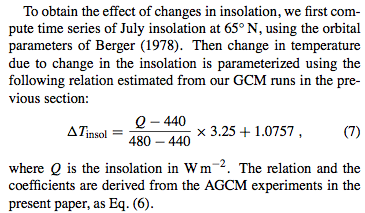 This is consistent with the finding of Krinner and Genthon (1999), who suggest a lapse rate of 5.5 K/km, but is in contrast with other studies which have conventionally used lapse rates of 8 K/km or 6.5 K/km to drive the ice sheet models..
Group Two – medium resolution GCM 2.8º latitude and longitude and 11 atmospheric vertical levels, with a “slab ocean” – this means the ocean is treated as one temperature through the depth of some fixed layer, like 50m. So it is allowing the ocean to be there as a heat sink/source responding to climate, but no heat transfer through to a deeper ocean. So this group takes a slightly more detailed look at ice sheet impact. Not surprisingly the simulation results give intermediate values for the ice sheet extent at 12 kyrs ago. Group Three – medium resolution GCM as in group two, and ice sheets either at present day or LGM, with nine simulations covering different orbital values, different CO2 values of present day, 280 or 200 ppm. Based on these GCM results we conclude there remains considerable uncertainty over the actual size of the albedo effect. Given there is also uncertainty over the lapse rate that actually occurred, it seems there is considerable uncertainty over everything. Now let’s return to the ice sheet model, because so far we haven’t seen any output from the ice sheet model. The equation which calculates the change in accumulation on the ice sheet used a fairly arbitrary parameter dp, with (1+dp) raised to the power of Ts. So think of it like this – we have found Ts at one value of CO2 higher and one value of CO2 lower from some snapshot GCM simulations. We plot a graph with Co2 on the x-axis and Ts on the y-axis with just two points on the graph from these two experiments and we draw a straight line between the two points. To calculate Ts at say 50 kyrs ago we look up the CO2 value at 50 kyrs from ice core data, and read the value of TCO2 from the straight line on the graph. So the method is extremely basic. Of course the model needs something.. There are three main points of interest. Firstly, small changes in the parameters cause huge changes in the final results. The idea of aridity over ice sheets as just linear function of ice sheet size is very questionable itself. The idea of a constant lapse rate is extremely questionable. Together, using values that appear realistic, we can model much less ice sheet growth (sea level drop) or many times greater ice sheet growth than actually occurred. Secondly, notice that the time of maximum ice sheet (lowest sea level) for realistic results show sea level starting to rise around 12 kyrs, rather than the actual 18 kyrs. This might be due to the impact of orbital factors which were at quite a low level (i.e., high latitude summer insolation was at quite a low level) when the last ice age finished, but have quite an impact in the model. Of course, we have covered this “problem” in a few previous articles in this series. In the context of this model it might be that the impact of the southern hemisphere leading the globe out of the last ice age is completely missing. Thirdly – while this might be clear to some people, but for many new to this kind of model it won’t be obvious – the inputs for the model are some limits of the actual history. The model doesn’t simulate the actual start and end of the last ice age “by itself”. We feed into the GCM model a few CO2 values. We feed into the GCM model a few ice sheet extent and heights that (as best as can be reconstructed) actually occurred. The GCM gives us some temperature values for these snapshot conditions. In the case of this ice sheet model, every 2 years (each time step of the ice sheet model) we “look up” the actual value of ice sheet extent and atmospheric CO2 and we linearly interpolate the GCM output temperatures for the current year. And then we crudely parameterize these values into some accumulation rate on the ice sheet. This is our first foray into ice sheet models. It should be clear that the results are interesting but we are at a very early stage in modeling ice sheets. 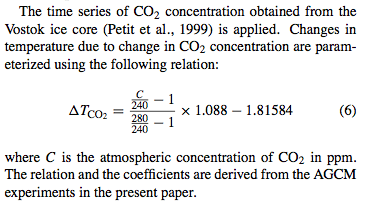 Note 1 – the value of CO2 used in these simulations was 200 ppm, while CO2 at the LGM was actually 180 ppm. Apparently this value of 200 ppm was used in a major inter-comparison project (the PMIP), but I don’t know the reason why. PMIP = Paleoclimate Modelling Intercomparison Project, Joussaume and Taylor, 1995.